SOLIDARITY TD PAUL Murphy and five other men have been found not guilty of falsely imprisoning former Tánaiste Joan Burton and her adviser during a 2014 water charges protest. The jury of seven men and four women returned the unanimous verdicts today after just over three hours of deliberations. The court room, which was packed to capacity, erupted in cheers as the verdicts were handed down shortly after midday. There were cheers of “No way, we won’t pay” and several supporters broke down in tears. Paul Murphy, South Dublin County Councillors Michael Murphy and Kieran Mahon, Scott Masterson, Frank Donaghy and Michael Banks were on trial in Dublin Circuit Criminal Court for over two months. They nodded and smiled as the not guilty verdicts were handed down. They had pleaded not guilty to falsely imprisoning Ms Burton and her adviser Karen O’Connell by restricting their personal liberty without their consent at Fortunestown Road, Jobstown, Tallaght on November 15, 2014. It is a charge that carries a maximum sentence of life imprisonment. The charges against a seventh accused, Purcell (50), of Kiltalown Green, Tallaght, were dropped towards the end of the prosecution case after Judge Greally ruled that the extension of his garda detention in February 2015 was unlawful. Judge Greally thanked the jury for their “exemplary” service and told them they had shown extreme bravery and courage in taking on the case. A juror was discharged halfway through the trial for personal reasons. She exempted them from jury service for life. There were further cheers in court as she told the six men they were free to go. The 40 day trial, which started on April 26, heard the two women were attending a graduation ceremony at An Cosán adult education centre in Jobstown when demonstrations broke out around them. The jury heard they were detained in vehicles for three hours as they attempted to leave the area. The prosecution case was that by surrounding the cars, the accused men engaged in a joint enterprise to “trap” the women and totally restrain their liberty. The defence argued that their clients engaged in a peaceful protest and this could not amount to false imprisonment. They submitted that at worst, their clients were engaged in obstructing a vehicle or delaying and inconveniencing the women. Paul Murphy (34) of Kingswood Heights, Tallaght; Kieran Mahon (39) of Bolbrook Grove, Tallaght; Michael Murphy (53) of Whitechurch Way, Ballyboden, Dublin; Michael Banks (46) of Brookview Green; Scott Masterson (34) of Carrigmore Drive, Tallaght and Frank Donaghy (71) of Alpine Rise, Tallaght had all denied the charges. An Garda Siochana do not comment on matters which are or have been before the courts. 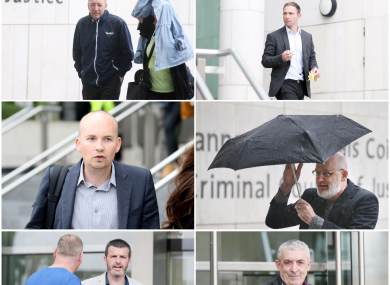 Email “Jobstown protest: TD Paul Murphy and 5 others found not guilty”. Feedback on “Jobstown protest: TD Paul Murphy and 5 others found not guilty”.